^ 1.0 1.1 Official: FC Barcelona agrees lucrative deal with Qatar Airways. totalbarca.com. [September 16, 2013]. （原始内容存档于August 30, 2013）. ^ 卡塔爾航空入股國泰　5日輸5億. 東網. 2017-11-11. ^ Barcelona search for airline sponsor after Qatar Airways talks break down. espn.com. 2017-09-27 [2018-06-25] （英国英语）. ^ Roma, Qatar Airways nuovo main sponsor: 40 milioni più bonus in 3 anni. ^ Qatar Airways será el nuevo sponsor de Boca hasta la temporada 2022/23 - LA NACION. www.lanacion.com.ar. 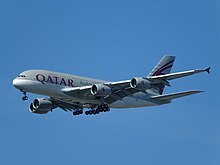 ^ 14.0 14.1 Qatar Airways Announce Order for 30 787-9 Dreamliners, 10 777-300ERs. Boeing. 7 October 2016 [8 October 2016]. ^ Qatar Airways Announce Order for 4 777-300ERs. Boeing. 25 September 2017 [25 September 2017]. ^ "Boeing/McDonnell Douglas Orders and Deliveries." Boeing. ^ Qatar A300-600 destroyed. Flight International. 2007-05-01 [2013-06-12]. ^ 吉祥航空拒不避讓內幕:節油量與機長收入挂鉤. 人民網. 2011-09-07 [2016-05-23].